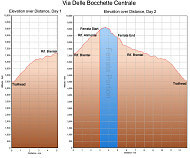 This page describes one section of a particularly famous extended route known as the via delle Bocchette. 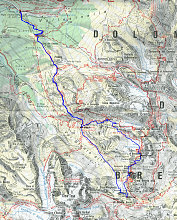 The via delle Bocchette is a more-or-less level high-altitude route that runs along partway up the high peaks of the Brenta Dolomites (The Brenta Dolomites are a separate sub-group of the main dolomites). The Bocchette Centrale section of this route offers spectacular scenery and a distinctive ladder-and-ledges type of experience. The climbing is not very difficult, but there are frequently large dropoffs and major exposure. This page describes just one segment of this via delle Bocchette: the "centrale" part. 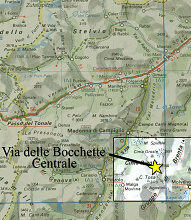 The centrale portion runs from near the Rifugio Alimonta to the Bocca di Brenta. There are many ways to approach the ferrata, and you can do it in the north or south direction. The itinerary you see presented on this page is but one option. We started off at the Vallesinella car park, not far from Madonna di Campiglio, and took trail number 318 to the rifugio Brentei (which is where we decided to stay for the night). From the rifugio, take trail 323 a short ways up to the rifugio Alimonta. From the rifugio Alimonta, you can look up and see a small glacier remnant and a gap above it. The central section of the Via delle Bochette starts at this gap and heads south. If you are so inclined, crampons can be useful getting up the glacier ice, although there are many embedded pebbles and rocks, and there are no crevasses, so the danger is minimal. As I've said earlier, the route is primarily a "ladders-and-ledges" affair. Starting off with a few bits of ladder, the route then runs along flat ledges for a long ways, sometimes with huge vertical drops below you, and a huge vertical wall above you. Along the way, there are also a few slightly wider areas that are unprotected. If you have a reasonable head for heights, these are no big deal. The route never actually goes to the top of anything; instead it contours along, roughly always at the same elevation, in and out of nooks in the cliff walls. Views are excellent.